The projected holographic video that we're used to only seeing in sci-fi in movies like Star Wars and Star Trek is now very much a reality. An optical sciences team from the University of Arizona published a paper in the scientific journal Nature today which describes a process that would allow projection of a 3D holographic image that can update in near real time. And you don't have to wear and glasses or anything to see it. In order to create the image, a pair of lasers are shot into an 11" screen made off photorefractive polymer which holds the image for about two seconds before another can be projected. The more cameras used to record the image, the higher the fidelity. It's not quite real-time, but it's the closest thing to R2-D2 showing the hologram of Princess Leia that we've ever had in real life. Not only can recorded images be projected but the technology is able to send the 3d video information over long distance. "Holographic telepresence means we can record a three-dimensional image in one location and show it in another location, in real-time, anywhere in the world," said Nasser Peyghambarian, the leader of the optical team. "At the heart of the system is a screen made from a novel photorefractive material, capable of refreshing holograms every two seconds, making it the first to achieve a speed that can be described as quasi-real-time," said Pierre-Alexandre Blanche, the lead author of the paper in Nature. I don't know about you, but I'm pretty excited that this technology exists. 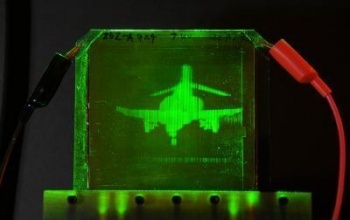 First off, being able to project a 3D hologram is just cool, and we're one step closer to the hologram biplane game from Star Trek III that I've been hoping for the last 20+ years.